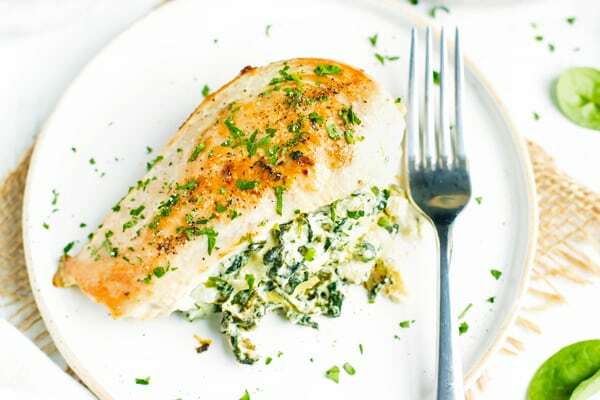 Spinach Artichoke Stuffed Chicken Breast is the perfect combination of your favorite dip and favorite bird, all rolled into one quick and easy stuffed chicken breast recipe! These spinach and mozzarella stuffed chicken breasts are gluten-free, low-carb, and Ketogenic diet approved! One of my all-time FAVORITE appetizers is Spinach Artichoke Dip. If it happens to be at a party, you know I am going to be hovering around that bowl the entire night. And I just might have a food baby from eating a bit too much of it! Do you linger around the spinach artichoke dip, too? 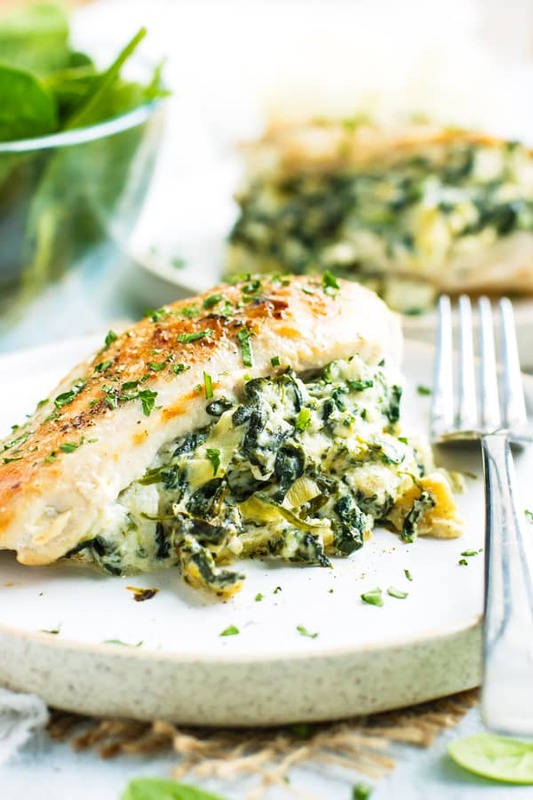 During one of my cravings recently, I decided to switch up this popular dip by turning it into a main dish… spinach and artichoke stuffed chicken breast! After a bit of experimentation, the results are in… they were a hit!! These spinach artichoke stuffed chicken breasts are officially being added to my favorite Ketogenic recipes list. They’re so simple to make, super flavorful, and ready in under 30 minutes! 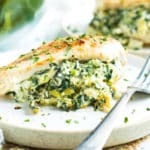 This spinach artichoke stuffed chicken breast recipe is loaded with (duh!) spinach and artichokes! Spinach is a powerhouse of nutrition boasting loads of Vitamin K, Vitamin A, magnesium, and full of dietary fiber. Artichokes are a close runner-up to the famous spinach… full of Vitamin C, Vitamin K, and a good bit of dietary fiber. 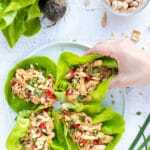 Add in some lean organic chicken breasts and we have ourselves a gluten-free, low-carb, and ketogenic chicken breast recipe for the books! How to Make Stuffed Chicken Breasts? Make sure your chicken breasts are at least an inch thick. This will give you adequate thickness on each side of the pocket for your spinach artichoke filling. Not necessary, but you can use toothpicks to hold the chicken breasts together. 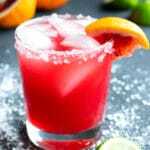 This will prevent the filling from spilling out while searing. Thaw out your frozen spinach COMPLETELY and strain the excess water again, and again, and again. 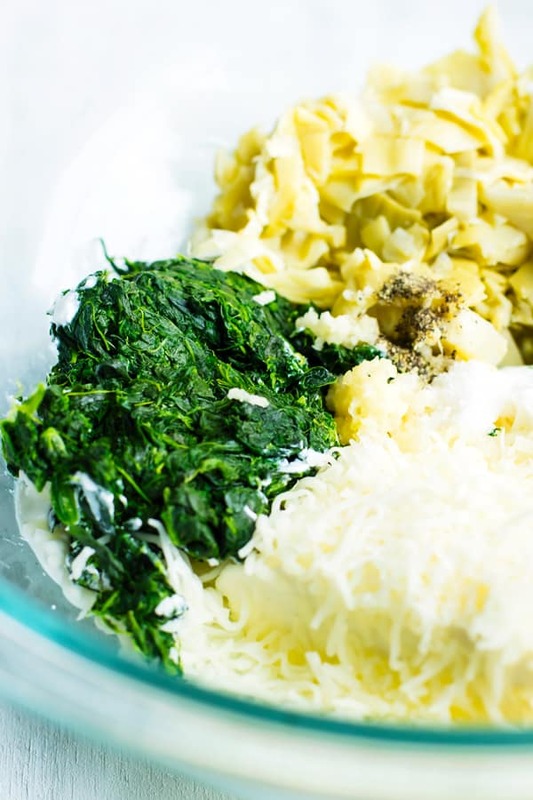 Pack down the frozen spinach to get your 1/4 cup. 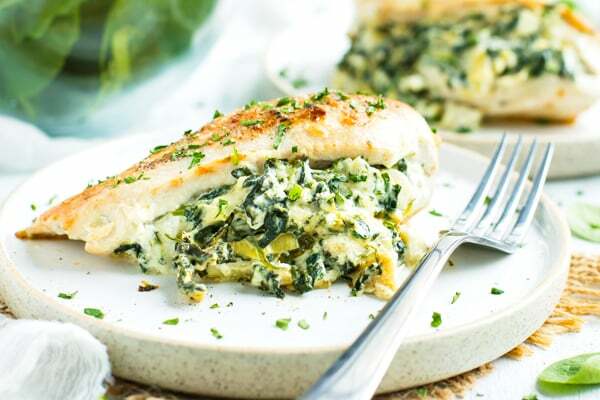 How Can You Evolve this Spinach Artichoke Stuffed Chicken Breast Recipe? Decrease the amount of dairy by using a dairy-free Mozzarella. Add even more spinach to bump up the nutritional content. Use organic chicken breasts and cheese. 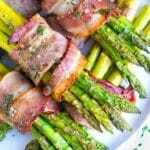 Want more Low-Carb and Keto Dinner Recipes? 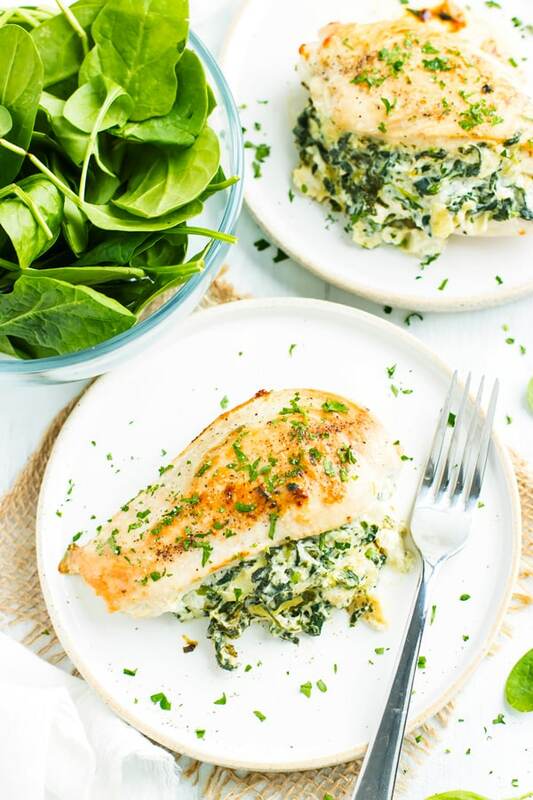 Spinach Artichoke Stuffed Chicken Breast is the perfect combination of your favorite dip and favorite bird, all rolled into one quick and easy Ketogenic stuffed chicken breast recipe! These spinach and mozzarella stuffed chicken breasts are gluten-free, low-carb, and Keto diet-approved! Pound chicken breast to 1-inch thick. Using a sharp knife cut each chicken breast down the middle, being careful not to cut all of the way through, to make a pocket for the spinach artichoke filling. 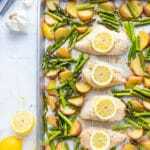 Sprinkle chicken breasts with ¼ teaspoon salt and 1/8 teaspoon pepper. 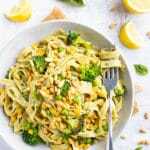 In a medium-sized bowl combine the cream cheese, Greek yogurt, Mozzarella cheese, artichoke hearts, drained spinach, ¼ teaspoon salt and 1/8 teaspoon pepper. Mix until thoroughly combined. Carefully fill each chicken breast with equal amounts of the spinach artichoke filling. If you have extra filling, set it aside until the chicken is almost done cooking. In a large skillet over medium heat add olive oil and stuffed chicken breasts. Cover skillet and cook for 7-8 minutes on each side, or until chicken reaches 165 degrees with a meat thermometer. During the last few minutes of cooking, add additional filling to the skillet to heat it up. Serve chicken with cauliflower rice, regular rice, mashed cauliflower, or mashed potatoes and enjoy! These stuffed chicken breasts look so delicious. I’ve never tried making stuffed chicken with artichoke before but it sounds like a great idea! Can’t wait to try this one at home. Thanks a ton for sharing! Absolutely, Kathy! I would try baking them at 375 for about 30 minutes, or until the chicken reaches an internal temperature of 165 degrees. Also, you can sear them in a skillet for 2-3 minutes/side and then bake for 20 minutes in the oven, too. Would love to know how they turn out for you! I have no luck whatsoever in slicing slippery chicken lengthwise for stuffing. BUT, I took the hint at the bottom of the recipe and just heated up the spinach-artichoke mix in the microwave. Then put it on the finished chicken and nuked all for a tiny bit longer. Wonderful! DEEE-LICIOUS! Thank you for the recipe! I made it exactly as stated. Next time (and there WILL be a next time!) I think I need to jack up my heat a bit, to get more browning. Not too rich, not too salty….just perfect! Can I add bacon to the mix? Absolutely, Chris! Bacon is always a welcomed addition 🙂 Would love to know how it turns out for you! 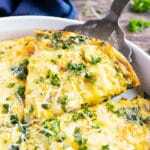 I’ve made this recipe twice now, and it turned out perfectly both times! I make a big batch so we have enough for the 4 of us plus leftovers. I cooked them in my cast iron skillets last time and the oven this time (375° for 40 minutes). I’ll do it in the oven from now on since I can fit everything into one casserole dish vs. standing over the cast iron skillet to cook two batches. 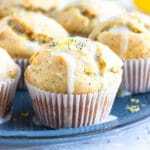 My husband and kids love this recipe, and it’s easy to prepare, so it will definitely be added to our regular rotation! That’s such a great idea to cook them in the oven, Stephanie. I’m sure it saves you a lot of time! Thanks so much for your kind comment and rating!! Hi Laura! Yes! You totally can. Just finely chop it before incorporating into the filling mixture. 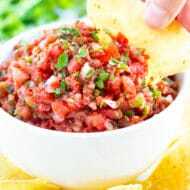 You can also sautee it a bit in a little olive oil or butter to make it easier to mix in. Great question! 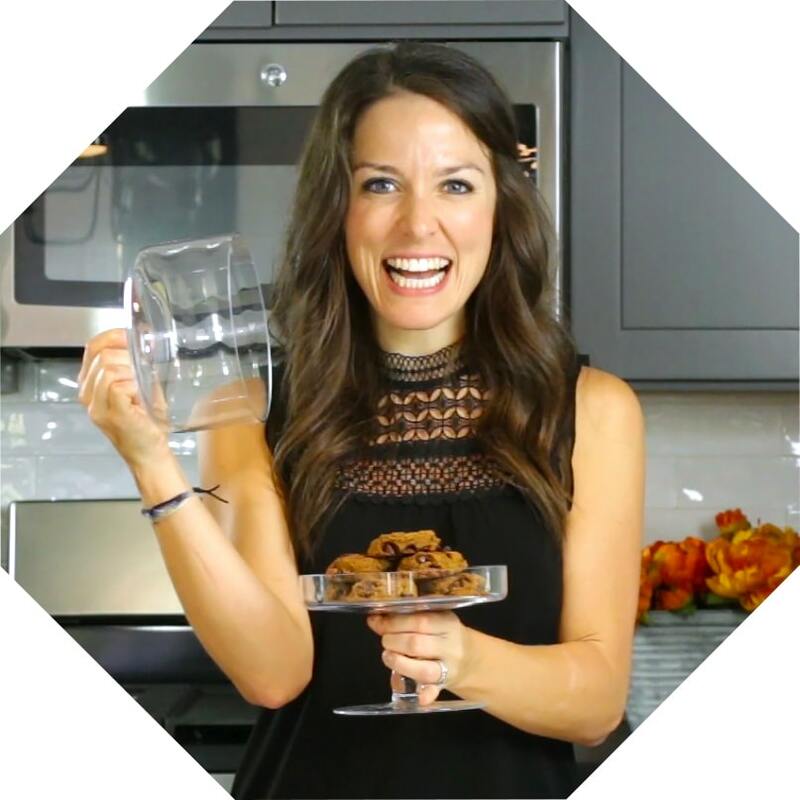 Have you ever tried freezing the leftovers and reheating? I’m wondering how this would do as a freezer to microwave dish. 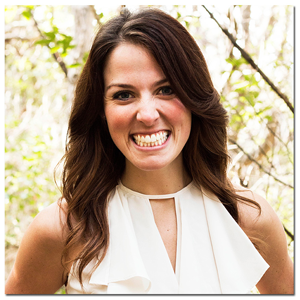 I have a meals to go along side my catering business…and I cook and freeze a lot of things! Hi Leslie! I have not tried freezing this exact recipe, but it should work! Would love to know how it turns out for you if you try it! This dish froze great, although I made a few changes. I substituted pepper jack for the mozzarella because of the texture. Also I didn’t stuff the chicken but spread the topping over the top pre cooked sliced chicken breast and then froze it. The uncooked filling came out perfect out of the microwave over the chicken breast. Thanks for the recipe! My customers loved it. I did freeze this with good results! Changes I made: used pepper jack instead of mozz because of consistency with microwave heating and instead of baking then freezing, I spread the filling on top of pre-cooked & sliced chicken breasts. The uncooked filling froze great and reheated well in the microwave with the chicken breast. I tucked some sauted mushrooms in with the sliced breast under the filling. Yum! Thanks for the recipe! Let me know if you have any other recipes you think would freeze/reheat well. I have never made spinach artichoke dip before, (I know), for the artichokes are they fresh or canned what do you use? This looks delicious. My family needs to cut down on the carbs, this looks like a great meal to start with. Hi Cindy! Great question. The aritchokes are the heart you buy in the cans. 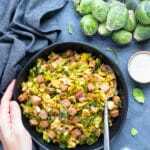 No need to dissect an entire artichoke for this recipe 😉 Thanks for your question! 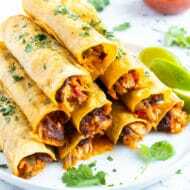 This is a great recipe simple and quick, great for a family meal. Love it! Hi I would like to make it this recipe today but the only thing I have in the fridge right now is muenster cheese would that be okay? Hi! I have not personally tried it with muenster, but always encourage experimentation! My only warning is that it might not work quite as well as the combo in the recipe. Would love to hear how it turns out for you! I made this last night. It was amazing! My husband went on and on about it! The only thing I did differently was adding a little minced garlic to the mixture. That’s just because we really like garlic. 🙂 Thank you for this recipe! I’m totally on board with the more garlic the better 😉 So happy you and your hubby enjoyed it, Stephanie! Thanks so much for your comment and rating! If you use fresh artichoke, it won’t soften in the middle of the chicken, leave it all in the pan to soften. What a great idea, Sam! Thanks for letting everyone know and for your comment/rating!